South Africa’s first CRM Roadshow was held at the end of March at Microsoft in collaboration with Mint Group. Aimed specifically at the Financial Services Industry (FSI), the event was deemed a tremendous success with the amount of Financial Services Providers (FSP’s) attending and logging in via live video conferencing from all over Africa, far exceeding expectations and capacity. Unique, fun, and informative were some of the words used by attendees to describe their experience of the day. The main message shared at the event stated that digital transformation is no longer an option but a necessity to ensure regulatory compliance, security and streamlined service delivery that enables, fosters and innovates customer centricity. Addressing the real pain points of regulations, Edward Blake Group MD, David Woolnough stressed that they should be approached through client-centered design thinking and that there is a need to move towards a risk-based approach. “Assumptions can kill a business,” and with the regulation list growing FPS’s need to avoid the risk of over-compliance and misinterpretation of regulations and should adopt client-centered design thinking. “Let your customers be part of the development cycle. Understand your customers’ journeys, limit the impact of regulation to your customer experience as much as possible,” Woolnough advised. This trend was demonstrated by Yolande Bothma, the Head of CRM for one of South Africa’ most renowned rewards programs, eBucks, who noted that, when it comes to customer centricity, content is everything. She then went on to explain how a CRM system is used to enable this, how it should be managed and customised to ensure that you are not just managing data but actually using it to ensure customer centricity. Following Bothma’s presentation, FNB CRM Portfolio Head, Muneer Ebrahim, shared how digital transformation is enabling FSP’s to be more customer centric; the main changes that are seen in client demands, how FNB is enabling dialog with its clients and what the four most important customer centricity drivers in the Financial Services Industry are. The day ended off with a spirited, interactive discussion between Mint Sales Executive, Francois Pienaar, and a panel of experts who addressed questions submitted by attendees. 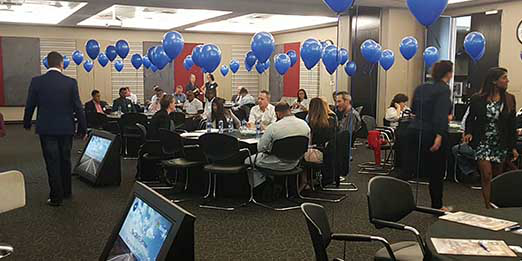 Paving the way for South Africa’s second CRM Roadshow in 2018, du Toit concludes that the event exceeded everyone’s expectations and highlighted the desire that Financial Services Providers have to network effectively, collaborate efficiently and ensure digital transformation for better client relationships.